Conflicting stories emereged today from the BMW camp regarding the potential of the F1.08. Nick Heidfeld seemed disappointed that the car is still not on the pace of the Ferraris and McLarens, although it has improved to have an edge over the Renaults, Williams and Red Bulls. And Robert Kubica pointed once again at instability as being its major shortcoming. He also cautioned against taking too much notice of test times, mentioning that these often disguised the true performance of the cars. It is all a bit worrying if you support BMW in their drive to win races this year. We have heard such guarded comments from teams in previous years and usually they are the prelude to a disappointing season. Looking at the times from Jerez today, there is even less cause for optimism; Kubica could manage no better than fifth fastest and Heidfeld was way down in eleventh. Disregarding Webber's Red Bull, which was almost half a second quicker than anyone else, the times are very close, however, little more than second separating the second fastest man, Rosberg, from Heidfeld. If we ignore Kubica's warning for a moment, it seems that Red Bull, Williams, Renault and BMW are all in the fight for third behind Ferrari and McLaren (I take it that Hamilton's sixth fastest time was not representative of the McLaren's true speed). That suggests a battle royal in store for us this season but it should be remembered that Ferrari are looking much the quickest at the moment. On the evidence so far, the top two remain the same and have kept their advantage over the rest - it is behind them that all the action will take place. 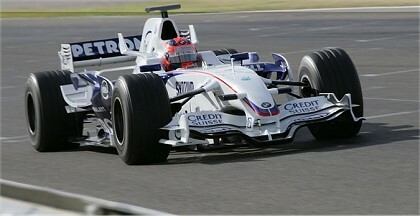 The BMW drivers are hoping that the car will be improved dramatically before the Australian GP. Once again, the story is that they know where the problem is and what needs to be done to fix it. I can only pray that they are right - who wants yet another season dominated by the same old teams? Of the brainwave, well, perhaps much more will come of that later. "we know what the problem is and we will fix it before Melbourne"
Have we not heard it too often? sounds worrying for BMW. And if you thought that sounded cliched, how about Jenson's latest statement on Honda? "We are also working on driveability as we adapt to the new ECU. These challenges were reflected in our speed at our debut test in Barcelona, especially on single fast laps, but our long-run consistency improved"
Single lap runs are bad but our race pace is good...yeah right. On the issue of racism, i think its time for all of us F1 fans to applaud Max and FIA (gosh, how hard it is to accept!!) for the "race against racism" campaign. First time ever the FIA have been proactive and not reactive. BMW's testing form worries me, Uppili, and I think it worries them too. We shall see in Melbourne, I guess. As regards the reaction to the race issue, I agree that the FIA has been reasonably prompt and clear in their actions. But, strictly speaking, doing things after the event is reaction - being proactive would have required that they foresee the possibility and take steps to prevent it ever happening. I beg to differ from you Clive. The way i see it, the abuse that Hamilton received and the race at Spain for which this campaign is planed are two separate events. Hamilton was abused racially and FIA reacted to it threatening sanctions. Full stop. Now when they go to Barcelona race and if unfortunately Hamilton is abused again racially by some morons and then FIA imposes sanctions it is reactive. The FIA here is trying to not only avert such a situation but also collectively gain support from other F1 fans in Spain. When they come together to support this campaign it will be for the world to see and then make a judgment in itself if the first incident was an isolated one or not. As a governing body of a sport the FIA cannot be proactive in its strictest sense as you say to any and every issue. There are probably a million issues in which everyone can be proactive but the knock on effect would be FIA being branded as a political organization which is not its business anyway. I see what you mean, Uppili. I view the FIA initiative as a reaction to the events at the Barcelona test, but you see it as thinking ahead to the Spanish GP. Fair enough, you are not wrong. I was merely quibbling at word definitions. Testing is always difficult to read but I tend to agree with your assessment. One issue worth considering is the relatively low number of tracks teams have run on. We saw last season how the performance of the top two teams varied from circuit to circuit so we could arrive in Melbourne and have something entirely different. The other thing of course is after the first race last season the Ferrari looked really good until its mass damper was er..clarified. So until we have the requests for clarification after the race we will have a far better idea where we are.